SOUTHAVEN, Miss. 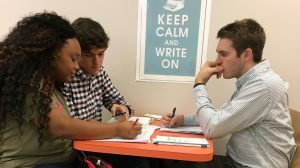 – As director of the Writing Center at the University of Mississippi at DeSoto Center-Southaven, Jeanine Rauch sees the value of honing writing skills early. The Writing Center at the UM regional campus offers free services designed to help students become stronger writers and critical thinkers. Teachers from DeSoto and Tate counties recently visited the center to glean ideas for creating and developing writing centers at their respective schools. “(Rauch) has long been of great service to her students, the students of the University of Mississippi, and to students at Northwest Mississippi Community College,” Cummings said. “Not content with this level of contribution, she is now extending opportunities for designing supplemental peer literacy instruction to her partners in the K-12 environment. Tarra R. Taylor, English teacher and writing center director at Hernando Middle School, met with Rauch this summer. Taylor began by reading and researching writing centers in colleges and secondary schools. The DeSoto Writing Center team provided Taylor with a number of resources, including “The Bedford Guide for Writing Tutors,” a sample writing center feedback survey, a tutor script and relevant articles. Rauch and one of the center’s consultants even accompanied Taylor when she presented the idea to faculty at Hernando Middle School. Many students enter middle school with “negative attitudes toward writing,” Taylor said. This could stem from a lack of confidence or limited writing skills, she said. “When the confidence level of students is built, students will want to write more,” she said. “In turn, writing achievement will be positively affected. The Hernando Middle School Writing Center launched Nov. 14. Taylor is confident that the center will make an impact on her students. Josh Green, English teacher and writing center director at Independence High School, also recently met with Rauch. Green’s writing center began in 2014 under the direction of Jason Jones, the writing center director at Northwest Mississippi Community College. When Green was named director, he began investigating new ways to develop the center. This year, Independence High School’s center has served some 20 students so far. Green recognizes the role that writing plays in student success. “Writing is a vital skill that essentially permeates all academic disciplines and endeavors,” he said. “Whether it is at the elementary, secondary, post-secondary or corporate level, writing is a key component in succeeding in any field. Rauch encourages schools to consider the development of a writing center. For more information about UM-DeSoto’s writing center, visit http://www.outreach.olemiss.edu/desoto/current/writingcenter.html.